The first accessible voting technology workshop was held on January 25-26, 2012. The workshop was structured as a design studio, with a series of group activities that moved from defining the barriers, to sketching ideas for how to overcome them, and then refining those concepts. The 32 workshop participants, which included election officials, designers, and accessibility advocates, formed teams to imagine new solutions to make the voting process more accessible to every citizen. Each team was assisted by industrial design students who sketched the team’s ideas and created posters to present the design concepts to the rest of the workshop participants. Each team focused on one set of issues relating to elections. The teams were given a set of personas, or sketches that describe a potential voter. The goal of the first session was for the team to identify barriers and challenges in designing accessible elections. To do this, the teams imagined each of the personas in their situation, and thought about the range of barriers that new design concepts must address. Pre-Election Information: Your voter is trying to prepare for an upcoming election. He uses the newspaper and Internet for learning about the candidates and ballot measures. He knows that he will need to use the accessibility features on the new voting systems for this year’s elections, and would like to learn how to use them ahead of time. In-Person Voting: Your voter will be casting her ballot at the local school. This is the first time that her precinct has had an electronic voting system. She knows that she will need to use the accessible voting machine and she is worried that it might not be set up or that it will be difficult for her to use without help. She is nervous that the poll workers won’t know how to set it up or how to show her how to use the machine, and that attention will be drawn to the fact that she needs help. Remote Voting: Your voter does not drive herself. She lives in a rural area without public transportation and needs to rely on others to drive her to a voting site. As a result, she sometimes misses the opportunity to vote. She would like to be able to vote remotely this year. She would also like this process to be as independent as possible. However, she cannot fill out a paper ballot. She could ask her aide for assistance in filling out the ballot, but they often disagree about politics, and the situation could be awkward. Ballot Design: Your voter is quite proud and independent. During his last election, when his ballot was read by the optical scanner, he found that he skipped several election contests. As a result, he needed to call a poll worker to receive a new ballot and fill it out again. Being an individual who prides himself on his ability to be independent, these mistakes caused him a fair amount of embarrassment. For this reason, he is anxious that he does not miss any of the contests or vote for the wrong candidates in this election. He wants to be able to mark and check the ballot himself. Next, it was time to come up with ways to improve the voting experience in each team’s scenario. We did that in a brainstorming activity. Brainstorming combines a relaxed, informal approach to problem-solving that helps people break out of traditional patterns of thinking. It’s a time to try out ideas that might seem a bit crazy at first, but might actually be very feasible or spark still more ideas. Over lunch, the group voted on the ideas, and the teams chose one to develop further. This started with an analysis of the Strengths, Weaknesses, Opportunities, and Threats (SWOT) in the concept. There was more discussion and sketching to develop the idea. The teams used the Universal Design Principles as a framework for identifying the goals for the concept. Universal Design is the design of products and environments to be usable by all people, to the greatest extent possible, without the need for adaptation or specialized design. Universal Design is a good set of principles to guide the design of elections, because it emphasizes creating one design for everyone. And then it was the end of the first day. The industrial design students spent the evening creating posters for each of the design concepts. We started the second day with a presentation from all the teams, and a discussion of the concepts. The rest of the day was spent refining the concepts and trying them out with a new set of personas. By the end, each of the teams had created two versions of their concepts and presented them to the whole workshop. A National Standardized Framework for voter registration, locations of polling places, sample ballots, and information. Sample Ballot and Information Transfer System to prepare voters for going to the polling place and creating a more enjoyable experience. Remote Voting Process / Express Voting: Voter profiles can list preferences and keep an updated list of special needs for voting. 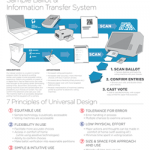 Concept analysis for an improved ballot design, including physical design concepts for an electronic screen for marking the ballot.